Teas: Green tea, Oolong tea and CTC Black tea. Herbs: Tulsi, Lemongrass, Mint, Peppermint, Garcenia, Moringa, Ginger, Harsingar, Gymnema etc. Spices: Cinnamon, Cardamom, Pepper, Clove, Nutmeg, Turmeric, Trifula, Fennel etc. Fruit extracts and Peels: Lemon, Orange, Carrot, Apple, Strawberry, Peach, Raspberry, Mango, Pomegranate etc(The above mentioned five categories of ingredients can be mentioned in the form of five bubbles with ingredients mentioned inside the bubble). Loose tea in tin packs or metalized pouches. Teabags – Mostly paper boxes containing 25 double chamber teabags in individual sachets/envelop. We handle the entire process of packaging covering procurement of ingredients (tea, herbs, spices etc) to final product packed in master cartons. 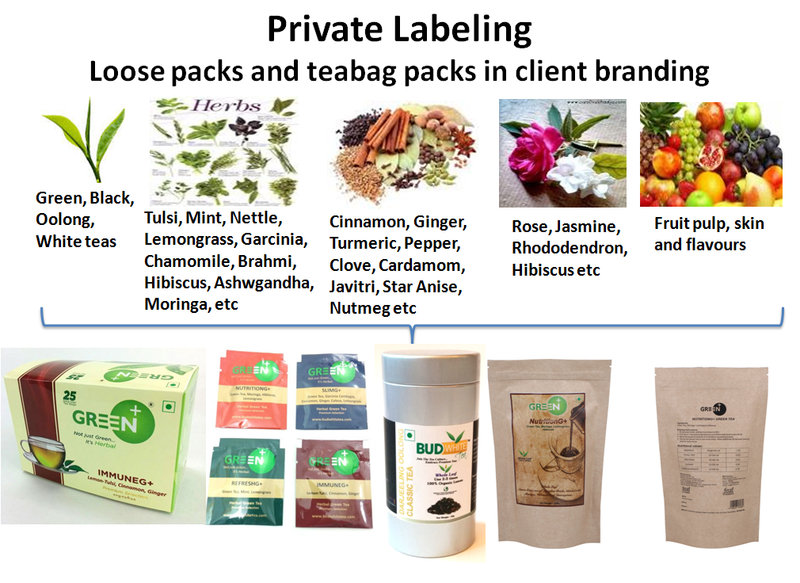 For sales and marketing of private labelled products in India, you should obtain FSSAI registration/license for your organization. We as packager will mention our FSSAI license number also on the packs. Please mention your requirements in the form below, and we'll contact you within 1-2 working days.